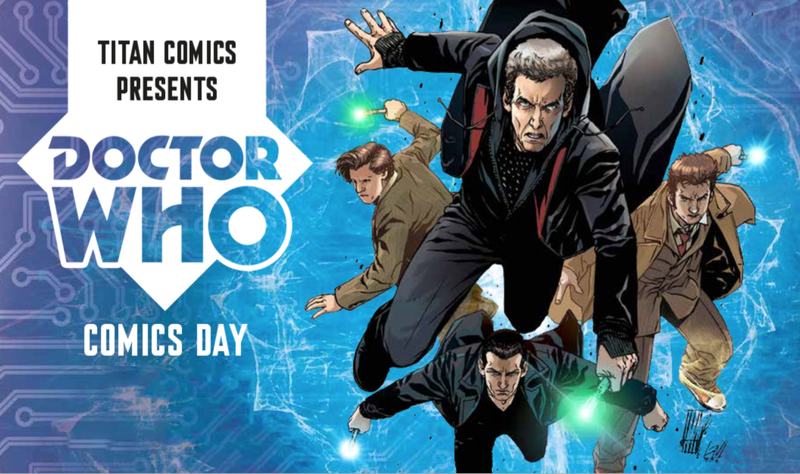 With the new TARDIS team arriving on BBC One Saturday April 15th, fans get a chance to continue their celebration of all things Doctor Who with Titan Comics’ Doctor Who Comics Day on Saturday September 2nd 2017. Doctor Who Comics Day is a global event inspired by Titan Comics’ Doctor Who comic books. 2017 marks the fourth annual Doctor Who Comics Day, set to be bigger than ever before with new comics and collections, merchandise, variant covers, signings, and events across the world at comic shops, bookstores, retail chains, libraries, and on digital platforms. This time around fans can even register for an event kit to hold their own reading group parties. "People have been clamouring for information about our next Doctor Who Comics Day for a while, so it’s great to finally reveal the date for this year’s cel-Who-bration!" said Titan Comics’ Brand Manager, Chris Thompson, "With the Doctor returning to screens for his most stunning adventures yet in Season 10, we want to up the ante and make this year’s Doctor Who Comics Day bigger than ever before! So, grab your Sonic Screwdriver and keep your eyes peeled for more details of this year’s special event. Allons-y!" More details about the 2017 Doctor Who Comics Day event will be released shortly.